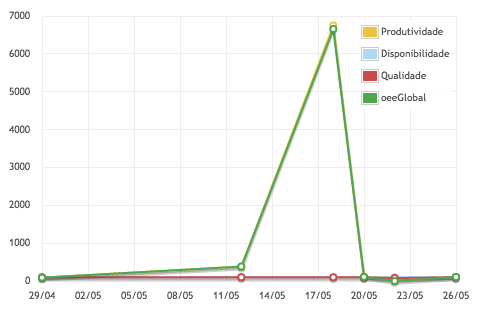 Temporal analysis – This is the kind of analysis that is selected by default when you add a new graph to a new tab at the Analysis Dashboard. In this graph you can see temporal series. By default, the time length is the last 30 days but you can change that to the time period which you want. Product Comparison – In this kind of analysis a circle graph is generated in which you can easily compare products with each other whilst considering different factors. 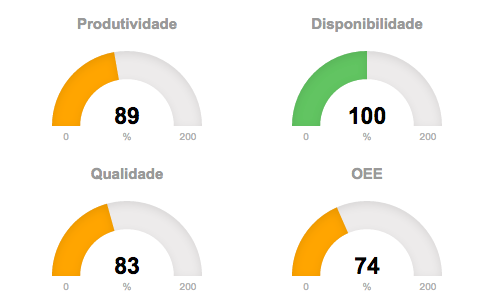 For instance, if you wish to compare different factors that constitute OEE (Quality, Availability and Productivity), the best way to do it is by pressing the button of this kind of analysis and the pressing the “OEE” button. 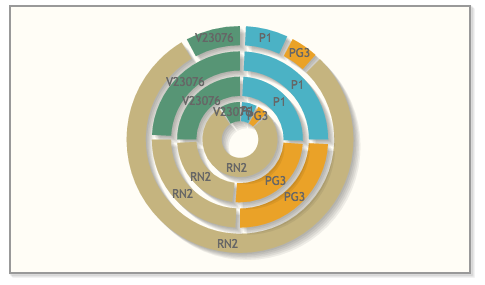 You will be able to see a circle graph with 4 “rings” in which each ring represents the OEE, Productivity, Availability and Quality, respectively. Among those ring you will be able to see, based on different colors, your products. 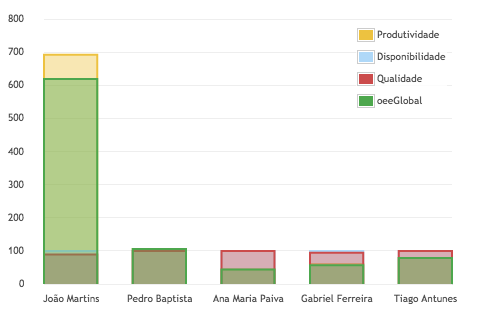 OEE Analysis - This type of analysis uses a graph which you might already know from our Dashboard. The indicators are exactly the same. The special feature in here is that you can choose other objects of analysis and analyze OEE and its constituent factors (Productivity, Availability and Quality) of each object. This is extremely useful if you want to know what the OEE of each Worker, Product or Operation is, for instance.